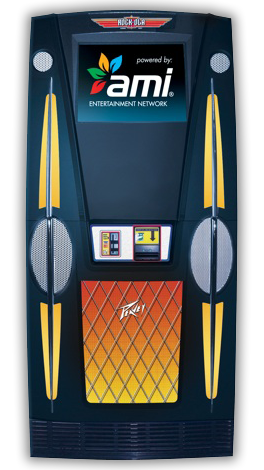 The Slimline is one of the most popular free standing internet jukeboxes due to its space efficiency and attractive style. A 900 watt Peavey amplifier provides plenty of kick to the enclosed speaker arrangement of a 15-inch subwoofer, 2 midrange speakers, and 2 tweeters to rock your establishment. Dimensions: 64 3/4-inch H x 30-inch W x 24 1/2-inch D, weighing 317 lbs.